We started buying children's books before our first child was born in 1990. We started homeschooling in 1995, we now have 2 graduates & 3 still in school with the youngest being only 5, so you can imagine how many books we have. We have 8 full bookcases in our house and we even have books in the garage. 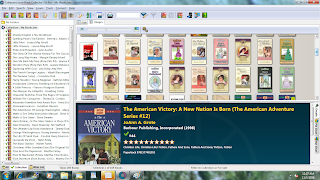 So you can imagine the excitement over my newest review for Book Collector 7.0 Pro. CDs, DVDs, books, MP3's, photos, comics & video games. This is a down loadable software so that it is on your computer & you can access it while off line. We reviewed the Book Collector 7.0 Pro, it was pretty simple to add books, you just enter the ISBN # and the author, title, publisher, date, number of pages and a cover picture show up automatically. I don't have one, but you can buy a scanner to scan the bar code of each book. We do have quite a few books that do not have an ISBN #, these books I added by typing in the name of the book and the author. If the book has been reprinted several times Book Collector Pro will give you a list of the books along with the publisher, date, and page number to help you chose the right one. E-Books and Audio Books can also be added to your collection by using the file or folder name as the book title. This is a screen shot of my books. You can see my book collection on the left and you can also see the book covers on the top. In the bottom of the screen you can see the selected book along with the Product Details: the language, cover price, dimensions, # of pages. There is also a direct link to Library of Congress & Amazon to see more details about the book. You can also see pie or bar charts of how many books you have in each Genre and keep track of books that you have loaned out. This program also adds up all the cover prices of your collection. This could be very beneficial for insurance purposes, you can print your list and the total amount of money you have invested. You can also upload your book inventory online, for $19.99 a year, that way you can access it from any computer, mobile phone, or you can email a link to your family & friends. This Book Collector Connect can be used with the software or as a stand alone program. 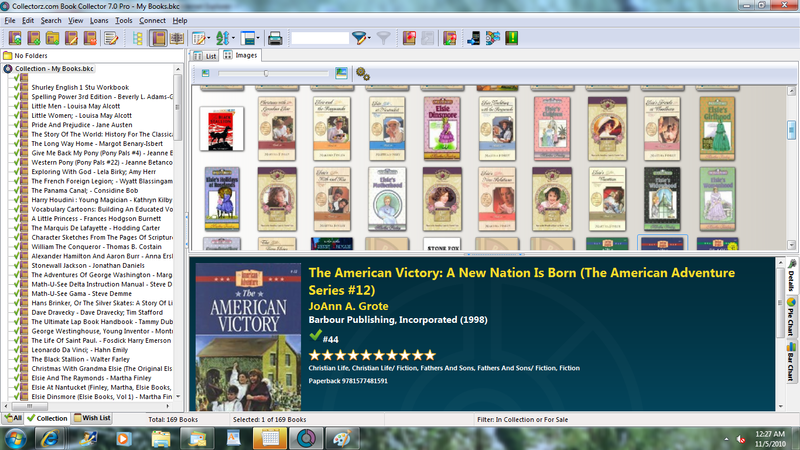 This program is a very useful tool to help keep your collections organized. I can think of a few people already that could really benefit from this program. I would recommend this to anyone who loves their home library. You can purchase The Book Collector Standard edition for $29.95, Book Collector Pro edition is $49.95. If you would like to purchase a scanner to make inputting a little easier you can do that at Collectorz.com also starting at $19.95. There is also a 30 day free trial so you can see how the program works before you decide to buy it. You can also check out the programs for movies, music, comics, MP3's, game and photo collector at their website Collectorz.com. Don't forget to jump over and read other reviews on this product by the TOS Homeschool Crew. As an affiliate of The Old Schoolhouse Crew I was given the Book Collector Pro edition from Collectorz.com in exchange for my honest review.